An exciting piece of news is coming out of England. An advertising group called Church Ads is starting a campaign that will lead up to Christmas called Baby Scan Jesus. 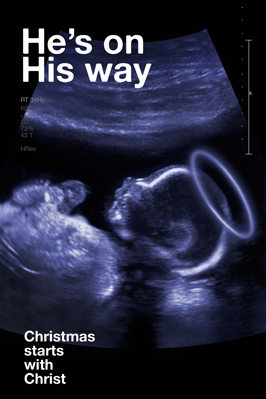 It is an ultra-sound picture of Unborn Jesus with the words, ‘He’s on His way: Christmas starts with Christ’. Thanks so much for such a great initiative! God bless You people who still understand what Christmass is all about. I was thrilled to see that there are people who are still interested in spreading the true meaning of Christmas. HE IS what it is all about! Thank you! A truly inspired and inspiring ad! May it save many unborn children. Beautiful, so moving! I’ve read about the campaign in Polish catholic paper. Keep the good job you are doing. Warm greetings from snowy Poland! It is fantastic to see a Christian group get together in this way, to stamp our mark of relevance in this seasonal period. Modern, Topical and hopefully the shape of things to come, bringing us closer to this country’s heritage. Yes, a lovely image. It caused unimaginable distress to my daughter, who had just lost her first baby at 12 weeks, and who had found out during a routine ultrasound that her longed for child was dead. How many other young women in her position have had to queue for a bus next to such a potent reminder of their loss? I am sorry for your daughter’s loss (and your family’s loss) but the image is a positive image. I can imagine that if a young woman or man lost a spouse they too would find it painful to look at pictures of happily married couples but no one would say that these images should be banned for this reason. Obviously, everyone would be sympathetic to the loss of the young man or woman and understand why these images caused them pain. And everyone would agree that no one was trying to hurt them by putting the image of the happy couple on the billboard. 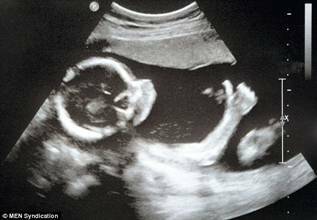 This image of the Unborn Christ Child is there to try to prevent pain, the pain of a young woman who must live with having aborted her own child and the pain of that child who will never be able to live. I pray for your daughter and your family in this loss you have experienced.